NEW YORK -- Apple is recalling some AC power adapters that it sold for use in Europe, South Korea and several other countries, after concluding that the two-pronged wall plugs may break and cause an electric shock. The company said it's aware of 12 "incidents" of malfunctioning adapters that were shipped with Mac computers and some iPhones and iPads between 2003 and 2015, although it didn't offer details. 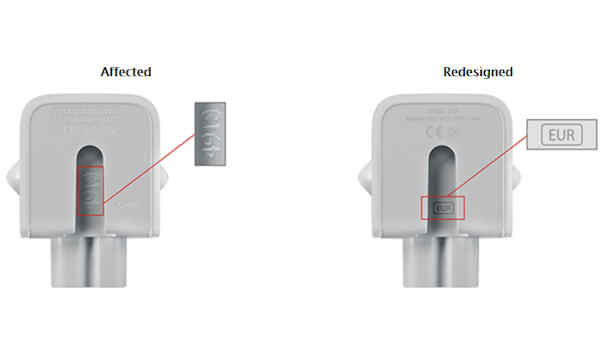 Some plugs affected by the recall were sold as part of Apple's World Travel Adapter Kit. The announcement comes a week after Microsoft announced its own voluntary recall of certain power cords sold with Surface Pro, Surface Pro 2, and some Surface Pro 3 computers before March 15, 2015. For more information, visit Apple.com/support/ac-wallplug-adapter/.